Across various parts of the country, health department officials are asking restaurants to voluntarily pull CBD-infused foods and drinks off menus. The latest local and regional governments that have reportedly taken steps against CBD are New York City, California, Texas, and Ohio banning the substance from restaurants and retail stores. CBD, or cannabidiol, which derives from cannabis, doesn’t cause the psychoactive effects for the lack of enough THC—the compound that gives people the “high” sensation. In fact, CBD proponents claim the substance is mainly used for its therapeutic benefits helping people relax, ease pain, anxiety, insomnia, and even depression. Despite the fact that not many studies have been done on cannabidiol in human trials, as pointed out by a recent New York Times article, we are seeing an immense amount of CBD products being sold across the country, with Walgreens as the latest retailer to announce plans to sell creams, patches, and sprays in nearly 1,500 stores in select states. So, why is it being pulled out of the restaurant space, specifically? Although, the farm bill that was passed in December 2018 legalized industrial hemp in the U.S., this only means industrial hemp was removed from the controlled substance category. Anything that is put in foods and drinks has to be regulated by the Food and Drug Administration and, as of right now, CBD is not determined safe or effective for other health conditions aside from being an active ingredient in an approved drug that treats two rare and severe forms of epilepsy. The FDA regulations are something different and there’s a huge push from lawmakers to change this. Since there is no federal law specifically addressing CBD-laced edibles, some states, like Colorado and Maine, have already attempted to clarify the status of the substance by passing laws allowing the addition of CBD to food, as reported by Reuters. California and Texas have introduced bi-partisan legislation to do the same, as reported by the Associated Press. Last week, the FDA slated the first public hearing to take place May 31 to discuss how to regulate CBD food and beverage products. In a podcast episode of Chef AF, Chef Brandon Foster shares with us a personal anecdote about how CBD has positively affected a local farmer to The point where this person wanted to dedicate the rest of his available land to grow hemp for the CBD industry. In an On Foodable Feature episode, our host Layla Harrison breaks down for our audience some of the CBD-infused products that have stood out from the rest. And in a Barron Report podcast episode, we learned about Azuca— a company offering CBD and THC products ranging from edibles to sweet syrups. We expect to continue hearing about ‘Culinary Cannabis’ and its impact on the restaurant business and society as a whole. so, stay tuned for more interesting content! 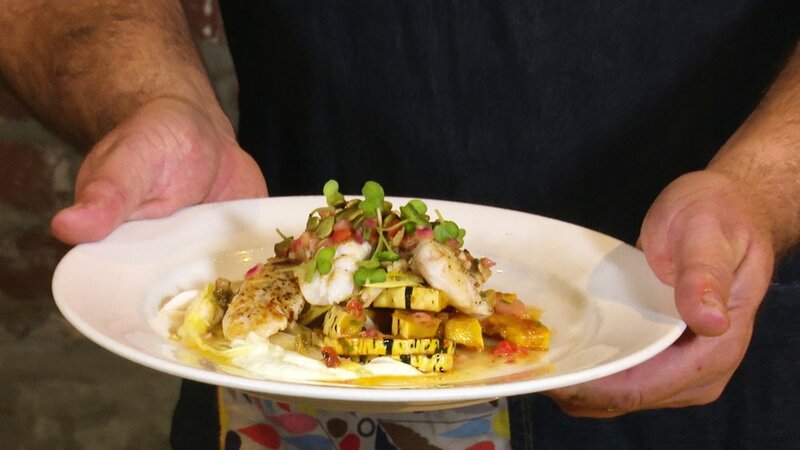 On this episode of On Foodable, Executive Chef Chris Schwartz from Tom Douglas Restaurants explains the newfound role of being a chef in today’s day and age and why it’s important to continue looking for new resources to cook with. During Foodable.io Seattle, Chef Schwartz prepares a unique dish using wild Alaska pollock, provided by Trident Seafoods. The wild Alaska pollock is paired with harissa, moroccan-like chili paste, used to glaze a newaukum delicata squash. Chef Schwartz tops his dish off with a drizzle of a charred jalapeno-basil vinaigrette, giving another kick of flavor and spice to the overall dish. Executive Chef Chris Schwartz has spent the last 30 years in the restaurant industry overseeing, leading and managing kitchens, along with a small army of chefs, sous chefs and cooks. He is an invaluable leader to Tom Douglas and his business-partner wife, Jackie Cross. The couple own and operate 14 restaurants, including Seatown Market Diner, another successful Seattle-based Douglas restaurant. Their variety of offerings can be enjoyed during any season, whether you’re staying warm with chowder during the winter or cooling off with a seafood cocktail during the summer! Listen to "33 How Rich's Helps Define the Terms— Clean Label and Sustainability" on Spreaker. Authenticity in their products, foods, brands, you name it. On this episode of The Barron Report, Jen VanDewater, Vice President of Health and Authenticity at Rich Products Corporation, sits down with our host Paul Barron to discuss how a large company like Rich’s is addressing consumer concerns over clean labeling and authenticity when it boils down to the products they offer. Listen above to learn more about this company’s sustainability and social efforts! Can Aquaponics Change the Food System? It can be said that in recent years, cold brew coffee has quickly made its way into mainstream. Cold brew has a smoother chocolate coffee flavor as opposed to other versions of coffee. The reason behind this is the fact that more coffee grounds are used and the steep time can be quite long and delicate since instead of hot water, room temperature or cold water is used for this process. This bitterless beverage has in turn carved itself a path to reach consumers directly through grocery stores in made-to-go bottles, as well as being incorporated as a drink menu item in coffee shops and some emerging restaurant brands, alike. Cold brew is actually experiencing a 2.4 percentage increase in integration on the Top 150 Emerging Brands. However, when it comes to the integration of cold brew on independent restaurant menus, the drink is actually experiencing a 23.4 decrease year over year when 5,000 concepts were analyzed by Foodable Labs. This could be a reason why cold brew has been declining in consumer sentiment in the past twelve months. Its score has dropped a whopping 16.2 points from a high 87.4 to a low 71.2 out of 100 points total. One wouldn’t think this was the case from looking at the new products brands like Jameson and Apothic have been launching. The brand known for its triple-distilled, Irish whiskey decided to try its luck with a bottled version of the Irish coffee cocktail using cold brew from Fairtrade Arabica beans. The cocktail features “intense coffee bean aromatics combined with vanilla nuttiness of Jameson,” according the brand’s website. As Foodable has reported in the past, Apothic Brew released in April of this year a red blend wine infused with cold brew. The winemaker, Debbie Juergenson, “realized that many of the characteristics in cold brew coffee and red wine naturally complement each other.” The result? A balanced red wine with a red fruit, mocha, and oak flavor. Despite the lower consumer sentiment score, social discussion over the topic has actually been up 3.1 percent in the past year. This could be due to the integration of the beverage into established beverage brand products. So, what exactly is motivating brands to jump outside of their comfort zones and explore new innovative ways to spice up their offerings with flavors like those from cold brew? What’s for sure is that there’s a growing appreciation for the beverage as Americans continue to learn more about the sourcing and creation process of coffee. To learn about how popular cold brew coffee brands are ranked by consumer sentiment and who is the leading the demographic consuming it, watch the Industry Pulse video above! Listen to "36 Female-Led Funding Startup AccelFoods Helps Other Food-Focused Startups like Soozy's Thrive" on Spreaker. Ever wondered how grocery stores will look like five years from now? This is something Jordan Gaspar, co-founder of AccelFoods, thinks about daily. AccelFoods is a funding startup that invests in other startups that have the potential of disrupting food categories in the grocery aisles and beyond through their innovative products. On this episode of The Barron Report, our host Paul Barron speaks with Gaspar and Susan Chen, CEO of Soozy’s, a frozen, gluten-free baked good product company that has partnered with AccelFoods in order to grow its business. The three discuss how the relationship has been between the venture capitalist group and the investee, Soozy’s role in its snacking category, what types of companies AccelFoods seeks to invest on, and trends in the marketplace among other topics. Listen above to learn more about these trailblazing companies!